Orange is what hunters wear in the woods to protect themselves and others from harm. Orange is a bright, bold color that demands to be seen. You see, this whole thing’s a mix-up. Tell the media the truth. Tell your gun-fearing friends, too. 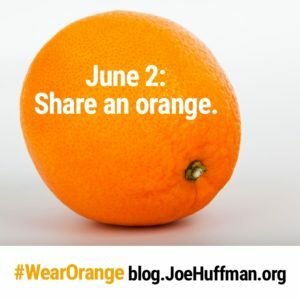 Wear orange. (Even if you’re not a Broncos fan.) And, conceal carry an orange. Seek out public spaces where Everytown & Gang are hosting events (search here). Bypass the protesters. They’re a colossal waste of time. Go directly to the media. You see, The Everytown Gang spends zillions on their marketing campaigns. When you speak to their media, on their turf, on their day, you’re wasting their resources while maximizing yours. Great way to spread your word far and wide, on their dime. Kindly ask a reporter to listen for a moment. Tell them you’d like to bring honesty to the gun debate by offering a different viewpoint. Politely share the truth. Give them this link to gun facts.info. Keep it short and sweet; more guns = less crime. Thank the person, then offer them an orange. Maybe even peel it for them. Also offer to take your new gunfriend to a gun range, so they may learn hands-on about safe handling of firearms. Repeat. Do the same for friends, family, etc. Keep calm, cool, collected, just as you do at the gun range. Warning: Be prepared for anti-gun people to respond violently. Videotape the incident. You never know when they’ll mix it up n’ flip it the opposite way, claiming you assaulted them. File a police report on the assailant(s). Orange Pro Tips — My experience is: if you approach media peacefully, they’re typically grateful you’ve offered an opposing view. When you do the legwork, you save them time, and it’s usually appreciated. Worst case scenario: you have one less orange. 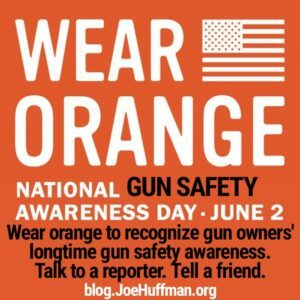 This entry was posted in Uncategorized and tagged Everytown Gang, Wear Orange by Stephanie. Bookmark the permalink. How fitting, They choose Department of Corrections Inmate Orange. Hopefully they will head to the nearest DOC and have a hug-a-thon. My orange clothing is an orange Browning Baseball cap from 25 years ago. I don’t think they’ll confuse me with the disarmers. Glad you have your gear. That is a chicken-s**t “orange” hat. I suppose it could be said that it “identifies” as an orange hat.